When you’ve made a mistake once, making it again is a lot like sticking your hand on a hot stove after you’ve already been burned. But it’s the repetition of mistakes that so brutally reinforces the need to learn…the screaming in your head as you tell yourself not to make the same mistake again in the future. 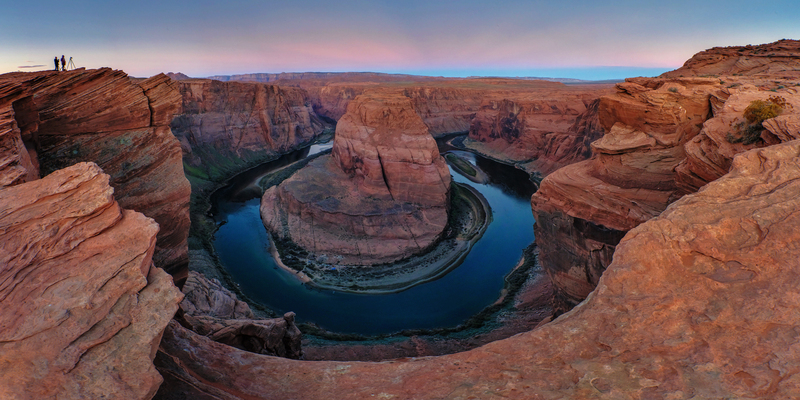 Horseshoe Bend, the subject of this image, is one of the Southwest’s great “Me Too” icon locations. It is a place where photographers go to get their own trophy shot. In terms of individuality or uniqueness, Horseshoe Bend is one of those “low-hanging fruit” locations near the bottom rung of the ladder. Often the difference between a decent shot and a great shot boils down to special lighting conditions. I knew the weather called for a clear and cloudless sunrise, which is a zero on the atmospheric specialness scale. While I was shooting, I noticed a guy setting up an 8×10 field camera. Once the sun had risen and we were packing to leave, I stopped to chat with him for a moment. It turned out he never even put a piece of film in his camera the entire morning. “It just wasn’t what I wanted or was looking for,” he said. By that time, I’d already realized my own mistake. Still, hearing that he hadn’t even loaded film into his camera suddenly made me realize that I was feeling absolutely no sense of loss. Why? There was absolutely nothing creative about the shot. No unique personal vision was involved. For me, this was just another “Me Too” shot of a place I’d already been to, even if it was a decade ago. I was far more upset with myself for not having remembered to change my ISO than I was coming home with a ruined shot. I guarantee I would have felt far more devastated if I had made the same mistake at a less-photographed, more personal location or even at the same location if there had been some really special lighting conditions. How Have You Screwed Up? We’ve all done it, from not resetting the ISO from a previous shoot (like me) to deleting our best shots. How have you screwed up? Let us know in the comments on this blog. I have loaded up the car, make it safely to the shooting location only to find I had not packed my digital media cards for the camera. One time I had to go to Walmart and buy a couple of cards for the day. Sometimes mistakes can lead us in new, creative directions and are a good thing. (Maybe not when on a job.) Many years ago (1980ish) when using transparency film (how archaic) I set an incorrect ISO while doing night photography at the UCLA Marci Gras. I realized this, however, before I had the film processed and asked for it to be ‘pulled.’ When I saw my processed slides, many of the images had a slow shutter speed effect that I actually enjoy using to this day.